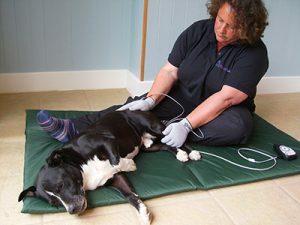 Electrotherapy tools are often used alongside manual therapies. Ultrasound, laser, micro current and pulsed electromagnetic energy all work at a cellular level on either superficial or deep tissues. These tools can provide pain relief, help control inflammation, reduce swelling, increase the rate of healing and assist in lessening scar formation thus encouraging a better quality repair. The choice of tool used will depend upon the injured tissue type, its depth within the body, and at what stage of healing it is. 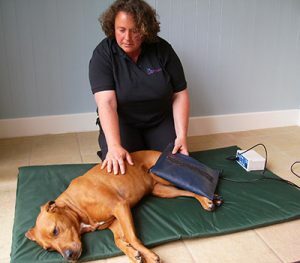 Different therapeutic results can be achieved using the various PEMF settings. PEMF influences cellular behaviour by inducing electrical changes around and within the cell. This alters the cell membrane potential, resulting increased calcium ion transport. This can result in accelerated fracture repairs, increased cellular regeneration, reduction in inflammation, increased localized blood flow and generally increase the rate of healing. Promoting and increasing the speed of bony union in both surgically and traumatically induced fractures. TENS is a non-invasive modality that can relieve pain by providing a stimulus to the sensory nerves, resulting in the body’s pain gate closing at spinal cord level. This stimulates an endorphin (body’s natural painkiller) release, providing an analgesic effect for the animal. This can be particularly effective for post-operative and chronic pain relief. These units are versatile and can be left to apply by the owner once training has been given. Phototherapy is an effective treatment that can be applied to a variety of common injuries and diseases. A number of photochemical reactions occur which can provide pain relief, enhance tissue healing and stimulate the lymphatic, immune and vascular systems. This modality has a cumulative effect both in the tissues and cells. Light is absorbed at cellular level and leads to a change in cell membrane permeability and an increase in ATP and nitric acid production. 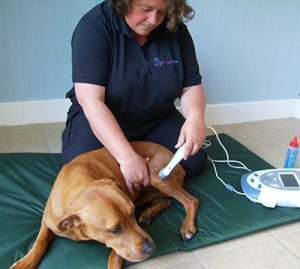 Therapeutic ultrasound is very effective in promoting the healing of musculoskeletal conditions. It can provide both thermal and non-thermal effects on the tissues, depending on the specific settings and treatment times. Ultrasound can be applied at two different wavelengths – 3MHz for superficial tissues and 1MHz for deeper tissues. Promoting new and repaired tissue fibre alignment. Breakdown of scar tissue / adhesions. Decreasing muscle spasm and increasing circulation. Promoting the extensibility of contracted tendons. Microcurrent is a modality that works at a cellular level to help stimulate the healing process. An electric current of one millionth of an ampere is applied which increases ATP (energy) production within the cells. This can restore the electrical balance of the body which is disrupted after injury. Provide relief to trigger points. Stimulate local blood supply and lymphatic flow.